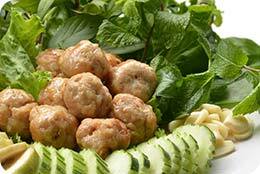 What is it about meatballs? They always seem to be the first thing to disappear from an appetizer buffet. Maybe it’s the fun of eating with a toothpick, or maybe it’s the thrill of getting such full-sized flavor in an undersized orb. In this version made with lean turkey meat, yogurt adds moisture, while fresh mint, garlic and cumin add zest. 1. Heat oven to 350 degrees. Line a baking pan with foil or parchment paper. Soak breadcrumbs in yogurt for 10–15 minutes. Add remaining ingredients and mix lightly until combined. 2. Use damp hands to form mixture into 24 meatballs. Arrange them on the baking pan and bake until lightly browned, about 25 minutes. Serve hot.